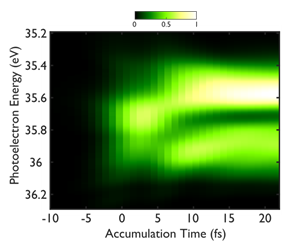 While the pulse durations of infrared lasers are reaching the fundamental limitation imposed by the duration of the optical cycle (a few femtoseconds), High-order Harmonic Generation has recently opened a new field by accessing the attosecond regime (1as = 10-18 s). HHG spectra are made of lines corresponding to the odd multiples of the fundamental laser frequency, and can cover a very broad spectral range, from visible light to soft X-rays. If these harmonics are phase locked, then the corresponding temporal profile is a train of attosecond pulses separated by half the laser period, whose duration decreases as the number of combined harmonics increases. 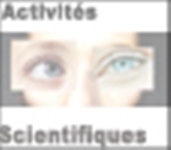 The first experimental demonstration of attosecond pulses was performed in 2001 by the attophysics group in collaboration with the Laboratoire d’Optique Appliquée (Palaiseau) and FOM institute (The Netherlands) using the RABBITT technique . We measured a train of 250 as pulses, corresponding to the superposition of five consecutive harmonics. In 2003 we extended this study by measuring the relative phases of the high harmonics over a broad spectral range . This uncovered for the first time the presence of an intrinsic chirp of the attosecond emission. Currently our activity is aiming at further developing these attosecond sources and at exploring the new physics they make accessible (see below). 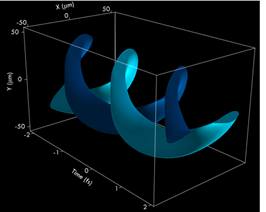 In-house theoretical studies provide support on these topics, using and developing 3D propagation codes in combination with Strong Field Approximation microscopic response. Further support is provided through external collaborations with theoretical groups in, e.g. Paris (LCPMR), or Madrid (UAM). P.-M. Paul et al., Observation of a train of attosecond pulses from high harmonic generation, Science, 292, 1689 (2001). We are working on two state-of-the-art attosecond beamlines installed in the brand new national facility ATTOLab. One attosecond beamline (SE1), developed on the former PLFA laser , is driven by the FAB1 laser (1 kHz, 15 mJ, 24 fs, CEP). The high laser energy allows multiple-beam designs as well as spatio-temporal/spectral shaping (e.g. frequency conversion using an OPA) for a versatile and flexible attosecond beamline. Controlling the trajectories of EWP: The measurement of emission times gives insight into the actual time spent by electrons in the continuum and has been found to be controllable by the laser intensity or more recently by molecular orientation. In the past years we have pioneered new techniques for complete characterization of Attosecond pulses , . We have shown how this complete characterization can be exploited to track the electron wavepacket (EWP) dynamics, from the ionization and acceleration steps to the radiative recombination with the parent core. The first two steps were investigated in atoms, pushing forward our previous work, unravelling the attosecond synchronization of the EWP trajectories, or the so-called attosecond chirp of the XUV emission. Understanding the EWP dynamics made its manipulation possible, either by controlling the quantum path interferences , or by using two laser frequencies to finely drive the EWP, a new way for producing isolated attosecond pulses . K. Varju et al, Reconstruction of Attosecond Pulse Trains Using an Adiabatic Phase Expansion, PRL 95, 243901 (2005)]. H. Merdji et al., Isolated attosecond pulses using a detuned second-harmonic field, Opt. Lett., 32, 3134 (2007)]. Besides atoms, we have investigated attosecond emission and high-order harmonic generation dynamics in laser-aligned molecules. In molecules, the nuclear degrees of freedom in a multi-centre system substantially enrich the EWP dynamics, resulting in structural interferences in the recombination step. 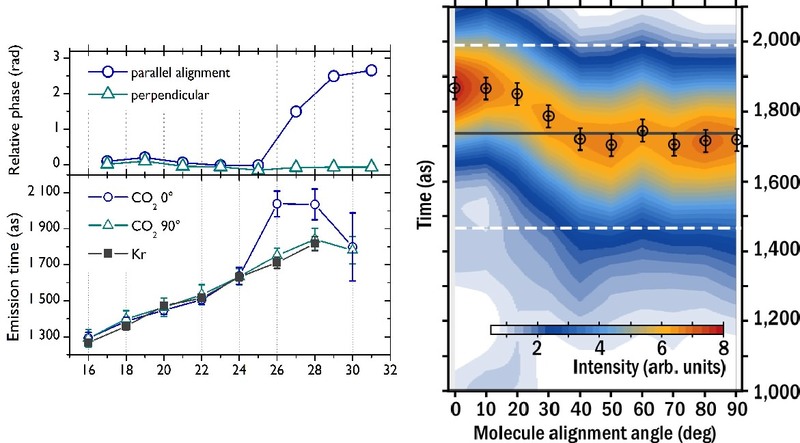 Moreover, the presence of multiple closely-lying valence states induces multiple ionization and emission channels, resulting in dynamical interferences in the recombination step. (Left panel) Phase measurement of harmonics generated in aligned CO2 molecules. (Right panel) Pulse profiles for different molecular alignments with respect to the generation laser polarization. Control on the timing and pulse profiles are achieved through alignment. We measured for the first time the phase signature on the harmonic emission of these interference effects (see figure). This interference effect allows performing a coherent control of the attosecond emission through variation of the alignment angle. This made the cover of the July 2008 issue of Nature Physics. W. Boutu et al., Coherent control of attosecond emission from aligned molecules, Nature Physics 4, 545 (2008). Visualizing the motion of electrons in matter requires both a spatial resolution on the Angstrom scale and a temporal resolution on the attosecond scale. We have demonstrated such an "ultra-fast camera" opening a path towards "viewing the electrons". It allows imaging molecular orbitals using the ultra-short attosecond emission from this orbital in an intense laser field. Indeed, the attosecond emission encodes detailed information on the orbitals that radiate , more specifically in the full transition dipole moment – amplitude and phase - which couples the recolliding electron wavepacket to the parent molecular orbitals in the recombination step. Information is reached by analyzing completely the amplitude and the phase of the emitted light in a broad spectral range, for different angles of alignment of the (linear) molecule versus the laser field. One can then reconstruct the orbitals from the dipoles using a tomographic procedure. The possibility of an "Attosecond-Angstrom" imaging is demonstrated in the case of the nitrogen molecule N2 . Our results were commented by a News and Views in the same issue of Nature Physics. More information can be found here. S. Haessler et al., Attosecond imaging of molecular electronic wavepackets, al. Nature Physics 6, 200 (2010)). Experimental reconstruction of the temporal buildup of the 2s2p autoionizing resonance of Helium in the photoelectron spectrum. Spectroscopy has taught us how the very precise measurement of resonance lineshapes gives insight into the structure of matter. However, as a time-integrated measurement, the spectral lines give only indirect information on the underlying electronic dynamics. The resonance width can be related to the timescale of the electronic excitation and relaxation, but, in the general case, this is not enough for accessing the details of the full dynamics that have to be recovered from advanced modeling. A typical case is the one of autoionizing resonances, where the system (atom, molecule, nanostructure) can be ionized either directly to the continuum or be trapped in a very excited state for a very short time (femtosecond) before reaching the continuum. The interference between the two channels results in an asymmetric lineshape, called Fano profile after the Italian theoretician Ugo Fano who first modeled this process. While the Fano profile has been extremely successful in analyzing the resonance lines measured in a wide variety of systems, the details on how the process unwraps in time have remained elusive, the ultrashort timescale at stake precluding direct time-domain investigations. 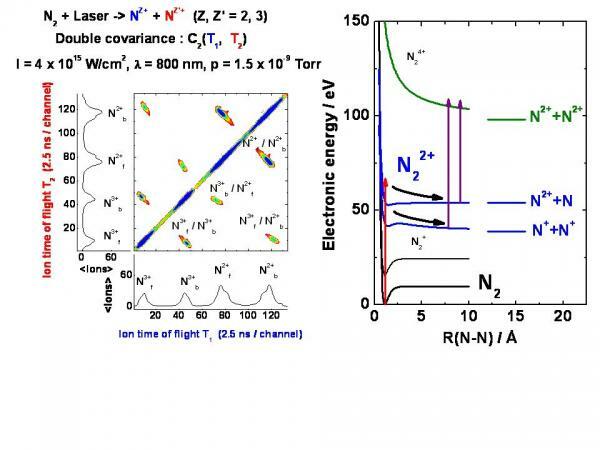 <In collaboration with two theory groups (LCPMR-Paris and UAM-Madrid), we have developed a new technique called ‘Rainbow Rabbit’ based on coherent multi-color ionization by an attosecond pulse train precisely synchronized with an infrared laser pulse ,. This technique gives direct access to the spectral amplitude and phase of the resonant electron wave packet emitted in the continuum. A Fourier transform then allows us to resolve the ultrafast buildup of the autoionizing resonance, revealing the decomposition of the process in two nearly consecutive steps governed by fairly different time scales (Fig. 1): during the first 3 fs, the direct ionization channel dominates; then, the resonant path starts contributing as the doubly excited state decays in the continuum, resulting in interferences between the two channels that ultimately shape the Fano profile. This technique opens multiple opportunities for studying ultrafast strongly correlated dynamics in a variety of systems, from molecules and nanostructures to surfaces, and controlling matter changes at a most fundamental level. Gruson V., Barreau L., Jiménez-Galan Á., Risoud F., Caillat J., Maquet A., Carré B., Lepetit F., Hergott J.-F., Ruchon T., Argenti L., Taïeb R., Martín F., Salières P., “Attosecond dynamics through a Fano resonance: monitoring the birth of a photoelectron”. Science 354(6313), 734-8 (2016). Busto D., Barreau L., Isinger M., Turconi M., Alexandridi C., Harth A., Zhong S., Squibb R.J., Kroon D., Plogmaker S., Miranda M., Jimenez-Galan A., Argenti L., Arnold C.L., Feifel R., Martin F., Gisselbrecht M., L'Huillier A., Salières P., “Time-frequency representation of autoionization dynamics in helium”, J. Phys. B 51, 044002 (2018). Experimental reconstruction of the attosecond structure resulting from the coherent superposition of high harmonic orders carrying a topological charge linearly increasing with harmonic order. Like massive particles may carry two types of angular momenta, namely spin and orbital angular momenta (SAM and OAM, respectively), the massless photon can be assigned two such characteristics. It was recognized earlier that SAM is associated with the circular polarization of light beams, but only 20 years ago was the OAM of light associated with beams with a tilted wavefront. In a series of experimental investigations, we extended the generation of beams carrying OAM to the extreme ultra violet (XUV) range   . 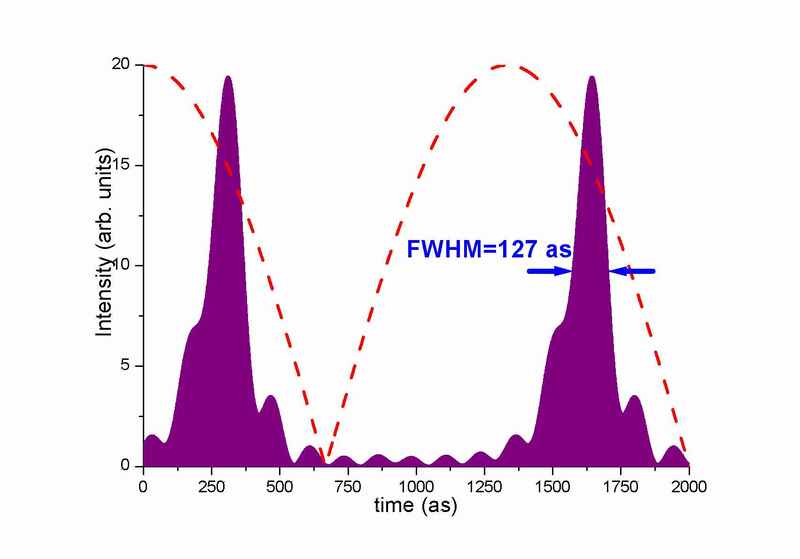 In practice, an intense infrared femtosecond beam carrying OAM is focused into a gas target to drive photon up-conversion in the XUV through high harmonic generation (HHG). We reported on HHG driven with an 800 nm beam carrying 1 to 3 units of OAM in different targets (Argon, Neon). In the far-field, we observed that the harmonic beam profile is donut-shaped and that the radius of the ring does not depend on the harmonic order. 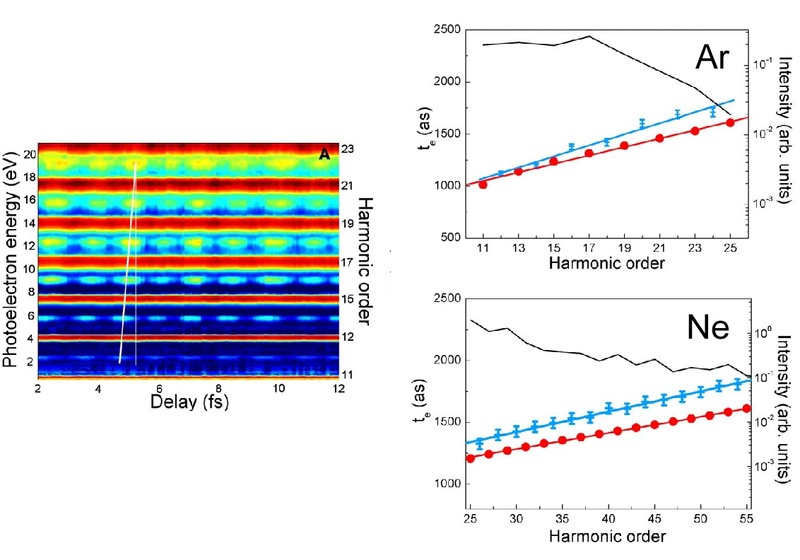 We show that this is consistent with a linear increase of the OAM with harmonic order, using an analytical analysis and a full 4-dimensional numerical experiment simulating HHG. We also measured the attosecond synchronization of the HHG comb with a cross correlation technique. This measurement allows us to reconstruct the attosecond shape of the emission, as shown in the figure. We further demonstrated control over the OAM in the XUV by setting the OAM of the driving IR field to 2 and 3 and by using a combination of two beams with given OAMs. 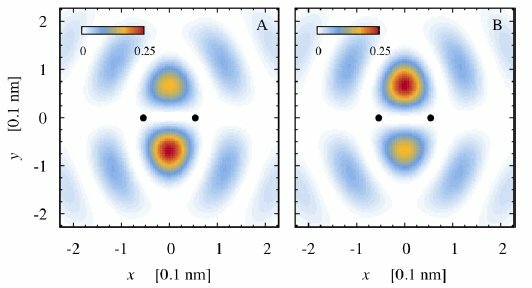 Our results open new perspectives for the synthesis of attosecond electronic springs through photoionization and investigate predicted but never observed helicoidal dichroisms. 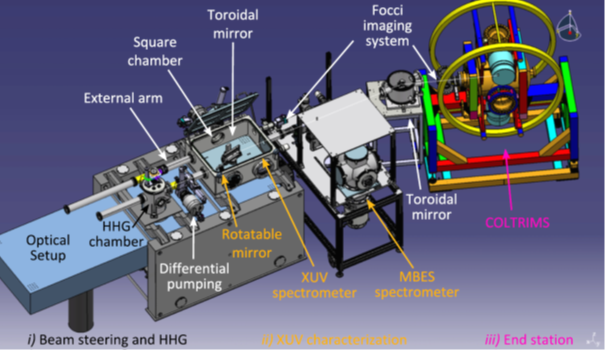 Géneaux, R., Camper, A., Auguste, T., Gobert, O., Caillat, J., Taïeb, R., Ruchon, T., “Synthesis and characterization of attosecond light vortices in the extreme ultraviolet”, Nature Communications 7, 12583, (2016). Géneaux R., Chappuis C., Auguste T., Beaulieu S., Gorman T. T., Lepetit F., DiMauro L. F., and Ruchon T., “Radial index of Laguerre-Gaussian modes in high-order-harmonic generation” Phys. Rev. A 95, 051801(R) (2017). Gauthier D., Rebernik Ribic P., Adhikary G., Camper A., Chappuis C., Cucini R., DiMauro L.F., Dovillaire G., Frassetto F., Géneaux R., Miotti P., Poletto P., Ressel B., Spezzani C., Stupar M., Ruchon T. and De Ninno G. “Tunable orbital angular momentum in high-harmonic generation”. Nat. Commun. 8, 14971 doi: 10.1038/ncomms14971 (2017). 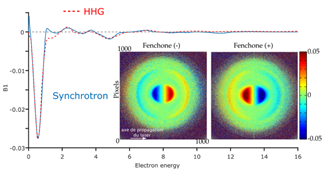 PECD of fenchone recorded on a Synchrotron (DESIRS@ Soleil) and an harmonic source (Aurore @CELIA). Inset: direct forward/backward asymmetry measured on a velocity map imaging spectrometer for the two enantiomers of Fenchone. Chiral molecules, which are not superimposable to their mirror image, are ubiquitous in nature. Their chemical and biological actions are very often handedness-dependent, making the analysis of their chirality of tremendous industrial importance. Yet the most popular diagnostic means, which are based on chiral chromatography and circularly polarized light helicity differential absorption, are not universal for the first one, quite insensitive for the second. Photoionization of these chiral molecules by circularly polarized XUV light offers an alternative to this drawbacks, thanks to the PhotoElectron Circular Dichroism (PECD) phenomenon. Indeed, in these experiments, a backward/forward asymmetry of the distribution of photoelectrons is observed, which is linked to the chirality of the molecule. The first such observations were made on synchrotron beamlines (DESIRS@ Soleil). Now, we lately designed attosecond sources capable of monitoring such PECD (Figure). Our results were calibrated using synchrotron data, yielding an overall good agreement. They open the way to time resolved monitoring of dynamics of chiral molecules with unprecedented time resolution, in the femtosecond and attosecond range. We started exploring this route through a collaboration with CELIA Bordeaux and DESIRS @ SOLEIL Synchrotron, yielding a series of publication,,.